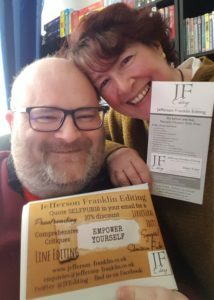 The team at Jefferson Franklin Editing are proud to be supporting this year’s Self-Publishing conference at the University of Leicester on April 28th – we’re in the programme, and you’ll find our list of services for authors everywhere you look. Sadly, we can’t be there in person this year – deadlines, deadlines – but we’ve decided to give authors who attend the conference an extra-special thank-you. The £50 voucher is on top of the 10% discount we’re offering to authors who book edits with us and quote SELFPUB18 in their email header – yes, we love you all that much – and the free sample chapter edits we offer as standard. Naturally, we can only give one voucher per attending author, but Like, Share and RT this message to your author friends, so they don’t miss out. 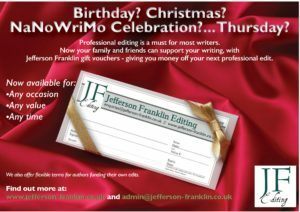 Now your friends and family can get you the gift you NEED – a Jefferson Franklin Editing gift voucher. It’s Black Friday, and you know what that means – blowout SALES! We’ve just launched our Jefferson Franklin Editing gift vouchers, so this Black Friday, your friends and family can support your creativity – buying gift vouchers towards the cost of an edit this weekend (redeemable whenever your work is ready for editing) – and get even more for their money. Email admin@jefferson-franklin.co.uk, and quote #blackfridayjfe2017 in the subject line to buy a £75 value gift voucher for only £50 (or multiples, ie £150/cost £100, etc). As an added bonus, this offer will be available until midnight Monday, the 27th of November. If your friends and family are already Black Fridayed out, don’t despair. We’re running a Christmas promotion on our gift vouchers too, until midnight on Christmas Eve – every voucher bought gives you a 10% bump – £50 gets you £55 of editing credit, £100 gets you £110 and so on.